Dark nonstick pans have become a very common sight in kitchens. While you still have to grease the pans in many cases, the nonstick coating makes it that much easier to extract the food from the pan. 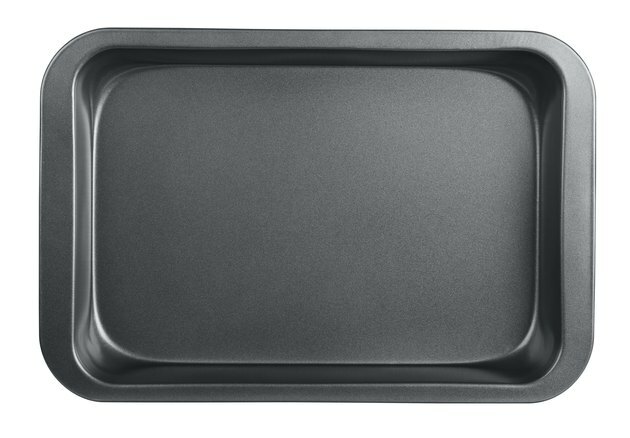 The dark shading of the pans, though, actually affects how the food cooks, making the edges darker than they would be if the food were baked in a light-colored pan. Adjust the temperature to compensate for the color. Preheat the oven to a temperature that is 25 degrees Fahrenheit lower than required by the recipe. Prepare the pan by greasing it or lining it with parchment. Fill the pan with the batter or other mix of ingredients. Bake for the time called for in the recipe, but at the lower temperature. Trim off any parts of the finished product that still appear too dark.